I've mentioned in the past that Thai Cuisine is a universally loved ethnic food in our family. We eat it whenever and wherever we can. Last week I made This Coconut Milk Braised Chicken from The Endless Meal and it was outstanding. I had most of the ingredients, but sent my daughter to the local Asian Market to get some fresh Thai chiles (those babies are HOT! ), Thai basil and lemongrass. The Coconut Milk Braised Chicken recipe instructions suggested that I serve the Chicken with the Thai basil sprinkled on top. Well…we were so eager to dive in to this succulent and fragrant chicken that I completely forgot about the Thai basil. So then, I ended up with a fresh bunch of Thai basil that needed to be used. DARN…guess we need to have another Thai meal soon so it doesn't go to waste! 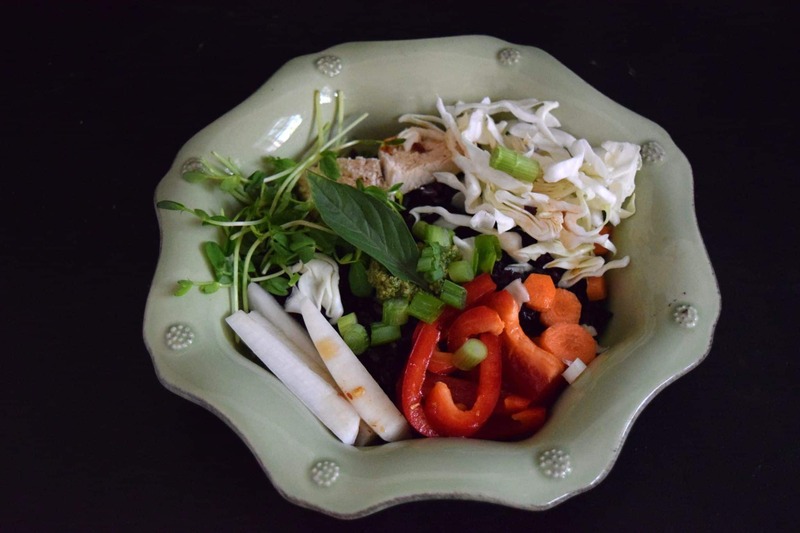 Enter the Thai Black Rice Bowl. This very simple meal can be for vegetarians, vegans or carnivores! If you're not familiar with Black Rice, this would be a good time to get acquainted! Black Rice used to be called Forbidden Rice back in the day as it was believed that only the then Emperor of China should benefit from its remarkable health properties. Black rice is higher in protein and fiber than any other rice and contains a high amount of antioxidants, as hinted to by its deep purple color. It has a great nutty taste and chewier texture than other rices. Plan to cook it longer than other rices, it takes about an hour. If you soak it for 30 minutes, it only needs to cook for 30 minutes. Either way, you're looking at an hour. I just put my rice in a bowl of water earlier in the day and it was ready to cook when I was ready. 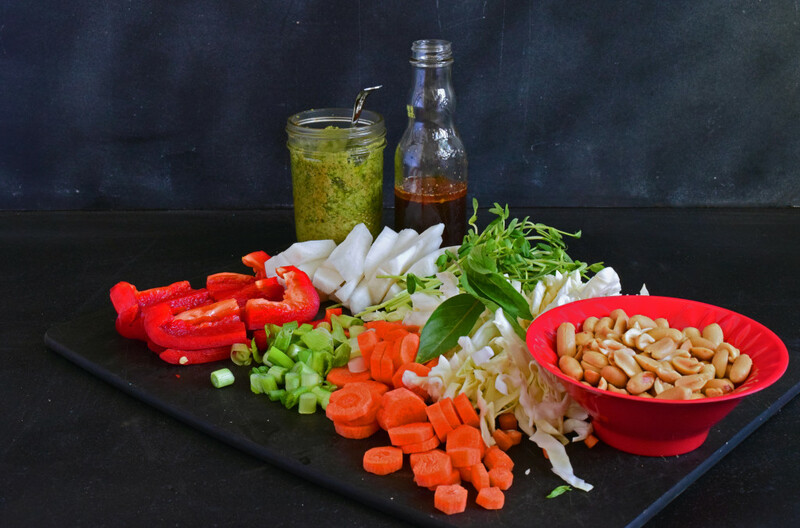 We made a Thai Basil Pesto in order to use up our Thai Basil as well as a Thai dressing. Both these ingredients really upped the WOW factor on our Thai Black Rice Bowls. While the rice was soaking, I prepared the pesto, vinaigrette and chopped my vegetables and poached my chicken. I slightly altered this pesto recipe from Flying on Jess Fuel. Use whatever vegetables you have on hand and add meat as desired. Some in my family added poached chicken breast while others went vegan. A Thai-inspired rice bowl with vegetables (and meat if desired), topped with a Thai Basil Pesto and Thai vinaigrette. Soak your rice 1-1/2 hours prior to dinner time. While rice is soaking, make your pesto, poach chicken if necessary, make your vinaigrette and chop your vegetables. Cook rice for 30-45 minutes until done. Will be a bit chewy, but shouldn't be crunchy. Place first seven ingredients in the bowl of your food processor and whirl it until it is finely chopped. Add olive oil in a stream through the spout in your food processor and process until smooth. Put rice in bowl and top with ingredients of your choosing. We lay everything out on the counter and let each family member make their own bowl. Top with pesto and/or vinaigrette. I used both and would definitely use both in the future. They each added a little something. Another example of the whole is greater than the sum of the parts.